Bonjour mon amies! Comme ca va? Oh excuse me, y'all don't speak French like I do?! That's a shame! It's also a shame that, that is pretty much all that I remember of my French classes from Grade 10. 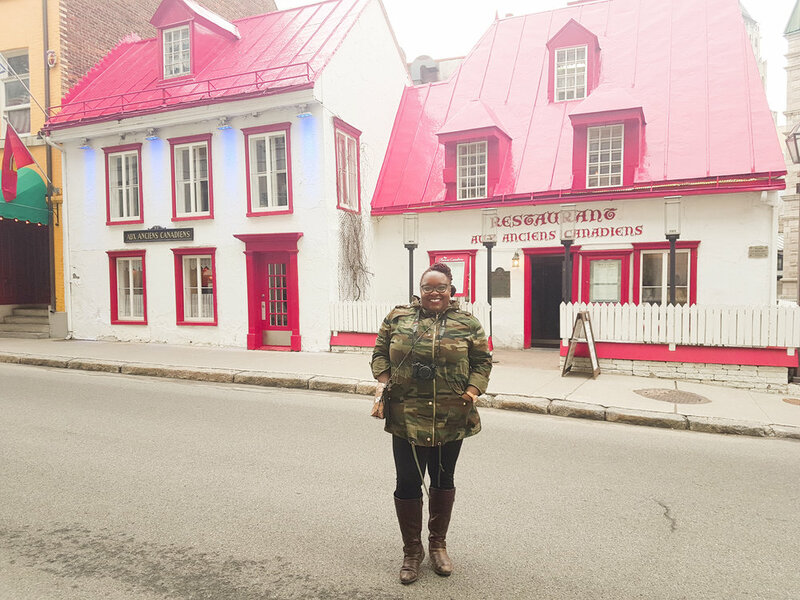 Uggghhh...When I found out that The Women in Travel Summit was taking place in Quebec City in Canada this year, I was excited to show off some of my French skills to my American friends who would be attending the conference. Little did I know that other than Bonjour and Au revoir, I was useless! 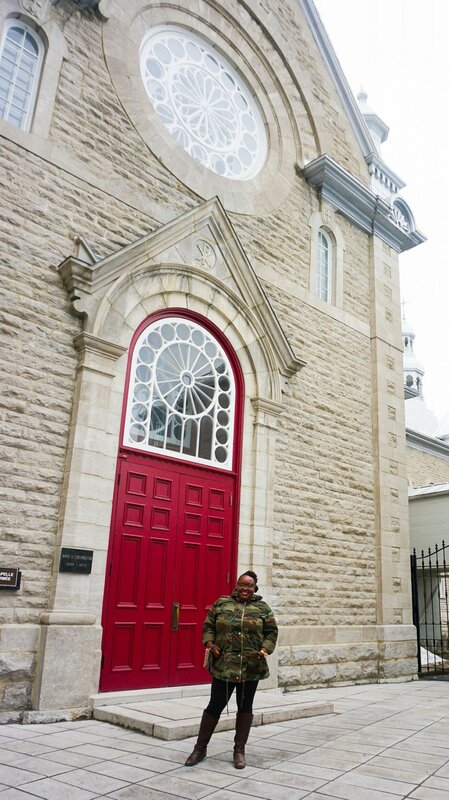 Quebec City has beautiful churches. Since I was going to be in Quebec City for a conference, I decided to make it an exploration weekend. An exploration of the best POUTINE ever!!!! Yummmmm poutine. Delicious French fries, topped with cheese curds, and gravy poured on top! I was shocked, no excuse me.. I was appalled that so many of my new American blogger boo's have never had poutine. Some of them have never even heard of poutine! Whaaaaattt??? The horror! So let me first talk a bit about the reason I was in Quebec City. Women in Travel Summit is a yearly conference for women in travel, mainly bloggers. Quebec City is actually the first international destination for this summit, as it is usually based in the U.S. But there are tourist boards, vendors, other bloggers who attend this event. So when I heard it was in Canada, I knew I wanted to be there and meet some of the bloggers that I look up to! As part of the Wits weekend, we got some free tours as well to get to know Quebec City (free is right in my budget!) I decided to sign up for a walking food tour...lol What? The best way to get to know a new city is to start with local food?!! I had to do it for the blog! I low key only wanted to go to spots with poutine, but Quebec City is known for their amazing wine, and delicious maple syrup. I mean they had maple syrup everything! Maple syrup toffee, maple syrup tea, they had light maple syrup, dark maple syrup. I'm pretty positive that I became pre diabetic from sampling every kind of maple syrup that Quebec had to offer! This is maple syrup made into balls. You can garnish your food with it, so you get a pop of maple syrup flavour. Maple syrup tasting. This is David our maple syrup expert. David is looking a little creepy right now...lol But he was awesome! For those who know me, know that I am not adventurous at all with food. We went to one bar that served Caribou blood! Yup.. you read that correctly. And I tried it! Raise your hands if you're proud of me!!!! It wasn't until we left the bar that our guide said 'just kidding, it's only liquor!!!' Hard steupse.... well other than here, I'm telling everyone that I was badass enough to drink caribou blood. When you ask people who have been to Quebec City, where they've found the best poutine, most would say Chez Ashton; And they are not lying. Unlike places around Canada that have adopted a million and one toppings to put on poutine, Chez Ashton's keeps it simple and delicieux (read that in a French accent!) But as I always say, when you want to know where the real yummy food is, speak to the locals. I asked my food tour guide where she goes to enjoy poutine, and she mentioned the Chic Shack which just happened to be right outside of my hotel. Sweet Poutine Jesus.... what heaven was that? It actually didn't look like typical poutine, but by far, was my best poutine experience. We're not even going to discuss the amount of calories that I racked up this weekend. Chic Shack.... best poutine ever! My home....well just for the weekend! 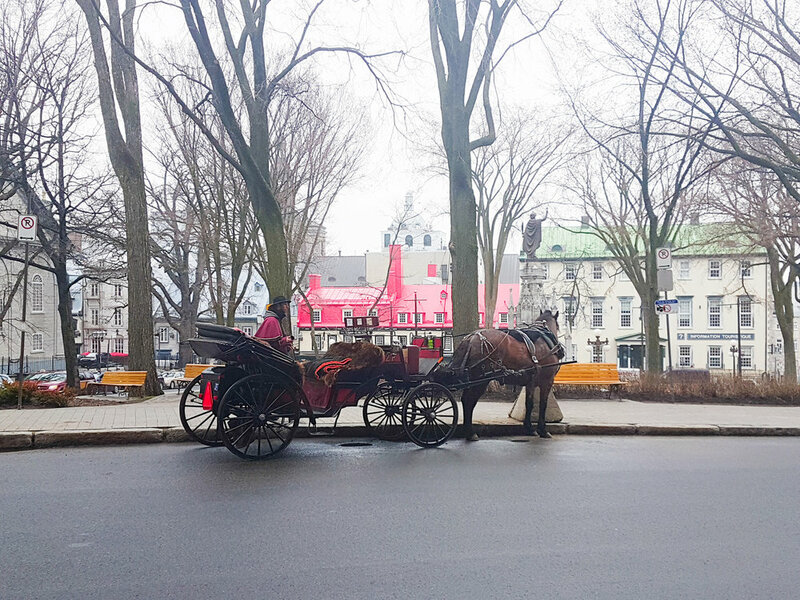 For some reason I thought that Quebec City would remind me of Montreal. I was completely wrong. Q.C. gives you the small town feel with little boutique shops and restaurants. Inside the Walled City, you don't even need a car, you can just walk everywhere. It reminded me of cottage country. Right below Le Chateau Frontenac was the cutest little city with one of a kind shops. Perfect to just spend the day walking, shopping and ducking into restaurants to try different wines. To get to that little city, you have to take a lot of stairs. However, on my way back up I discovered a tram for $3 that takes you up and down so you can avoid those dreaded stairs. 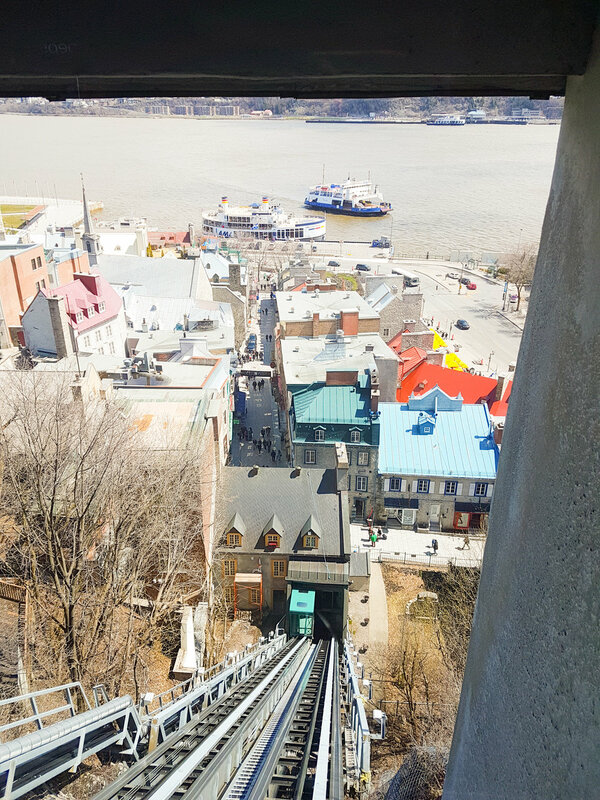 Down below, you can also catch a ferry to Levis Quebec. Supposedly it's a little town with a lot of history, but I just really took it to get the best photo opportunity of the castle! LMAO! What I really should have been doing was taking notes in the conference, but instead I snuck out just so I could find some trouble to get into! Why walk when you can take the tram! Let it be noted however, although many people feel that French Canadians are a little snooty, and walk around with their noses up in the air, I must conclude, this is not true! Perhaps it was because I was in the tourist area, but everyone that I came across was so pleasant. No stuck up attitudes. I swear French Canadians get such a bad rap. However, they are very blunt. If you want to read that as rude, that's your prerogative, but a few times I had to give a few people the side eye. Once at a burger joint, a man was there with his family and bought burgers. The bill came and he put down cash. The waitress took the cash, went to the cash register, made change (the change was a few bills...no coins. And the smallest bill in Canada is $5.) and when she went back to the table she said "You didn't want anything back did you?" Pardon moi????????? Yoooo if that was me, my girl would have to fork over my bills! You can't put people on the spot like that! But maybe it's a French thing because my second side eye of the trip was my taxi ride back to the airport. I was told at the castle (I could have easily said hotel here, but I stay being extra!) that the ride is $35. When I arrived at the airport I handed the driver $40 and very specifically asked for my change. The man took my $40, got out the car, took my suitcase out and stood there waiting for me to get out of his car. Once I did, he practically ran over my toe how quickly he drove off! Sooo that's a no on my change then huh???? I found a St Hubert's in Quebec City. Only my Canadian readers would understand the joy of finding a St Hubert's!! They were all over Toronto when I was growing up. Then they closed down all the locations and I believe they only remained open in Quebec. The best roasted chicken ever. I was in heaven! A lot of the streets there are uphill. Wear comfortable shoes. I most certainly worked off all the poutine with all that uphill walking! 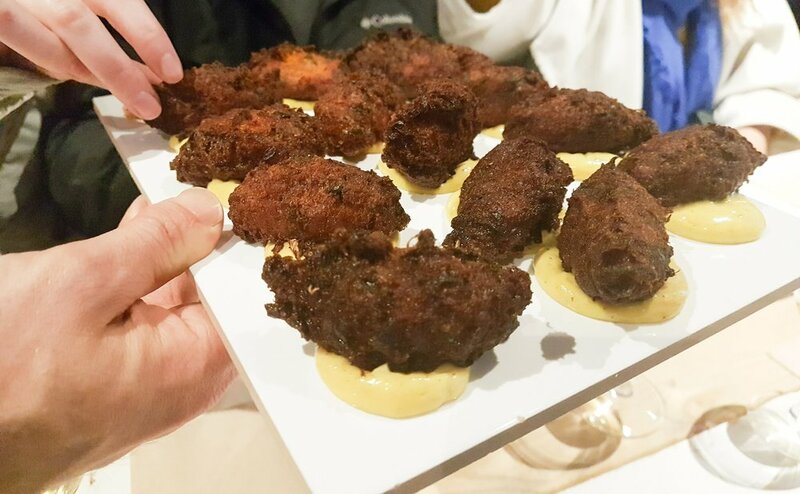 There was a lot more to eat than just poutine in Quebec City. They take pride in growing a lot of the food that they consume there. I even had honey straight off a honeycomb! Is it really a trip to Quebec City if I didn't try a cheese platter? They take their wine very seriously. If you are a lush like me, you will appreciate all the wine offerings of Quebec City. I'd like to send a special thank you to my French friend Annie Alain, who told me all the hot spots to check out in Quebec City. She got everything right! Although it's tempting to always visit somewhere hot and tropical, I urge you to discover a little more of Canada. It is beautiful. Why I Fell In Love With Cartagena Colombia: It Wasn't Just The Cute Men!